Adorne Tamper-resistant 3-Wire GFCI outlet in magnesium color, protects you from serious injury due to electric shock. It has two plugs and a classic look thermoplastic construction for long-life durability. It performs an automatic test every 3 seconds preventing the unsafe condition of power without protection. An innovative snap-in system ensures easy installation. This outlet operates at a voltage rating of 125-Volts and current rating of 15-Amps. It is suitable for kitchen, bathroom and outdoor spaces. 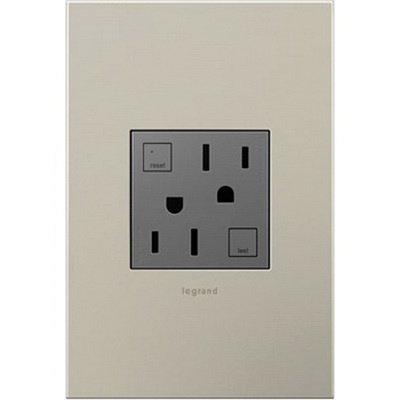 The GFCI outlet meets cULus and CSA standards.